Organisation of the nervous system. Neurological thinking. Pathological processes in neurology. History taking. Examination - introduction. Speech and higher function. The eyes and visual system. Fundoscopy. Cranial nerves 1, 3-6. Other cranial nerves. Limbs:motor. Limbs: reflexes and sensation. Gait. Coordination and abnormal movements. Neuroradiology. Neurophysiological investigations. Nerve conduction studies and electromyography. Neurogenetics. Cerebrospinal fluid and lumbar puncture. Headache. Blackouts and"funny do's". Giddiness. Intracranial pressure. Coma and alteration of consciousness. Confusion and delirium. Dementia. Disturbances of vision. Weakness. Numbness and sensory disturbance. Walking difficulties and clumsiness. Disorders of sleep. Stroke. Transient ischaemic attacks and prevention of strokes. Subarachnoid haemorrhage. Epilepsy I: Diagnosis. Epilepsy II: Treatment and management. Head injury. Spinal cord syndromes. Radiculopathy. Multiple sclerosis I. Multiple sclerosis II. Parkinson's Disease and other akinetic rigid syndromes. Other movement disorders. CNS neoplasia 1: intracranial tumours. CNS neoplasia 11:special situations. Infections of the nervous system. Peripheral neuropathies 1: clinical approach and investigation. Peripheral neuropathies 11: clinical syndromes. Common peripheral nerve lesions. Disorders of the motor neurone. Disorders of the neuromuscular junction. Muscle disease. The autonomic nervous system. Functional disorders. Neurology and psychiatry. Rehabilitation. 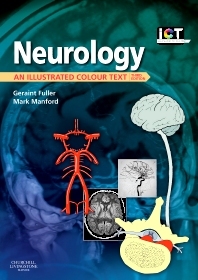 An introductory textbook of neurology in the Illustrated Colour Text series, making full use of all the usual features of the series - double page spreads, short paragraphs, summary boxes, attractive use of colour etc. Clear explanation of neurological examination - often found very taxing by students. Demonstrates how to approach common neurological presentations, such as blackouts and numbness, before moving on to a comprehensive coverage of syndromes and diseases. Concentrates on the core curriculum which the medical student really needs to know.